In the classic 1966 American science fiction film Fantastic Voyage, a submarine crew was miniaturized and injected into a body to fix a blood clot in the brain. That’s obviously not how future medical science is going to work, but the notion of creating microscopic machines to perform complex tasks is certainly on point. A recent advance, in which robots made from DNA were programmed to sort and deliver molecules to a specified location, now represents an important step in this futuristic direction. There are currently three emerging fields within DNA nanoscience, the science of creating molecular-sized devices out of DNA: The self-assembly of nanostructures from DNA strands, molecular computation and data storage, and DNA robotics, which is the focus of the study published today in Science. The central premise of DNA nanoscience is that, rather than creating molecular devices or systems from scratch, we can leverage the power of nature, which has already figured much of this out. If and when we finally master molecular machinery, we’ll be able to build microscopic-sized robots with programmable functions and send them to places that are otherwise impossible to reach, such as a cell or a hard-to-reach cancerous tumor. 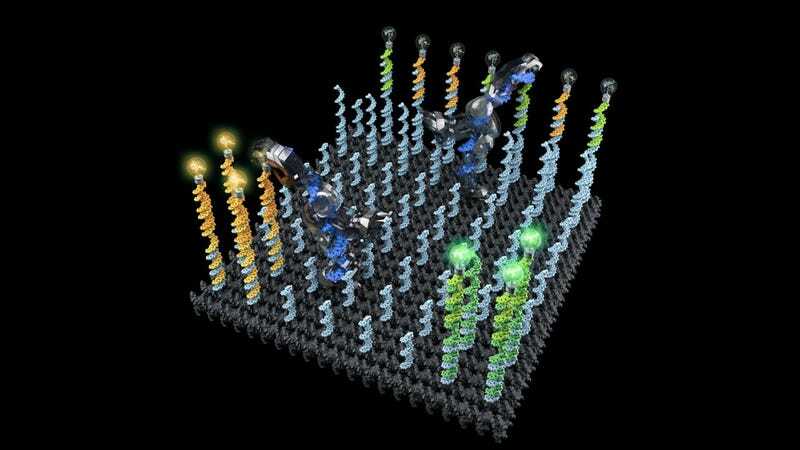 For the new study, the researchers designed a group of DNA robots that could collectively perform a predetermined task that had them walk along a test platform, locate a molecular cargo, and deliver it to a specific location. The bots were able to do this autonomously. Each robot, built from a single-stranded DNA molecule of just 53 nucleotides, was equipped with “legs” for walking and “arms” for picking up objects. The bots measured 20 nanometers tall, and their walking strides measured six nanometers long, where one nanometer is a billionth of a meter. For perspective, a human hair measures about 50,000 to 100,000 nanometers in diameter, so the scale we’re talking about here is ridiculously small. 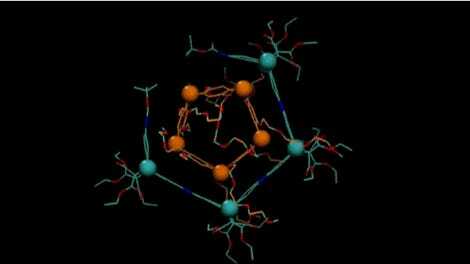 For the cargo, the researchers used two types of molecules, each a distinct single-stranded piece of DNA. In tests, the researchers placed the cargo onto a random location along the surface of a two-dimensional origami (self-folding) DNA test platform. The walking DNA robots moved in parallel along this surface, hunting for their cargo. To see if a robot successfully picked up and dropped off the right cargo at the right location, the researchers used two fluorescent dyes to distinguish the molecules. Scientists are not at the stage yet where they can program robots of this size to have built-in memory, so instead, the robots were designed to “match” their cargo. The researchers estimate that each DNA robot took around 300 steps to complete its task, or roughly ten times more than in previous efforts. “We successfully programmed complex behavior in DNA robots and compartmentalized each task using DNA origami,” said Thubagere. In experiments, 80 percent of cargo molecules were sorted, so there’s room for improvement. Qian and Thubagere hypothesize that not all molecules were correctly synthesized, or that some parts of the robot or testing platform were defective. Much more work needs to be done to figure this all out, and to test the DNA robots under different environmental conditions if we’re ever going to have these things working in our bodies. This new study offers a viable methodology for scientists to continue pursuing.